We've been really slow with news lately, and we apologize for that. In addition to this site, all three of us run Twilight sites, and since it's almost time for Eclipse to come out, and Taylor Lautner and Kristen Stewart are coming to Sweden, there is a lot of news and planning going on! Also, as always, there is end of school and real life things getting in the way, but hopefully we'll have more time to spare in a few weeks. 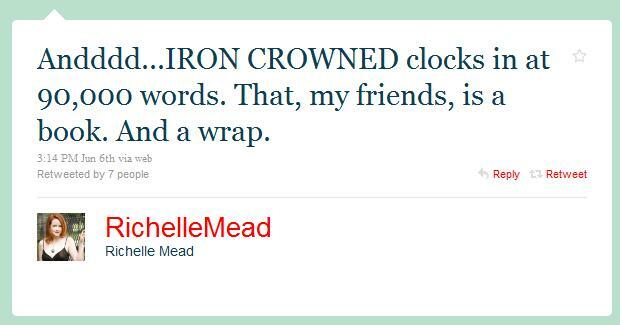 This isn't directly Vampire Academy related, but it is Richelle Mead related (and really great) so I wanted to mention it anyway. 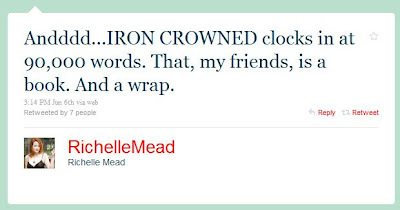 A couple of days ago Richelle announced on twitter that she was finished with Iron Crowned! IRON CROWNED, for those keeping score at home, is book #3 of the Dark Swan series. It's also the fourteenth book I've written in my career.